James Johnson-Perkins is a British artist whom currently lives and works in the UK and China. Johnson-Perkins has exhibited in leading venues in Europe, Asia and North America, Including: The IMAC Theatre, New York, USA, National Centre for Contemporary Arts, Moscow, Russia, FABRIKA, Moscow, Russia, The Chinese European Arts Centre, Xiamen, China, Toyota Museum of Modern Art, Japan, Centre for Contemporary Art, Glasgow and The Royal College of Art, London. Johnson-Perkins has exhibited work in over 50 International events, including: The Athens Photo Festival, Greece, Digital Long Island Media Festival, New York, USA, Lux Artist Film Festival, London, UK and at The Hay-On-Wye Festival, Wales, UK. He has also shown work during the Venice Biennale twice, exhibiting at the Galleria Perela and The Emily Harvey Foundation. Johnson-Perkins has participated on many international artist residencies programs, Including: The Chinese European Arts Centre Residency, Xiamen, China. The Emily Harvey Foundation Residency, Venice, Italy, The Bridge Guard Residency, Sturovo, Slovakia, The Kathmandu Contemporary Art Centre Residency, Patan Museum, Nepal and at The Art Student League of New York, USA. 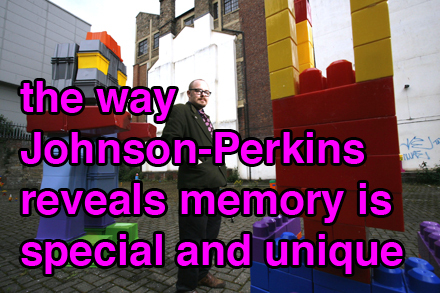 Johnson-Perkins' series of ultra-large scale digital GIGATAGE works use Gigapan technology and Montage. Here he creates landscapes of different modern and historical figures in renowned sites and civic squares. In his VIDEOSTALGIA works he combines important and poignant places with nostalgic music. These include filmed performances to camera, incorporating dance and disguise. The VIDEOSTALGIA works also re-look at films and TV programs, which were/are culturally valuable to the artist. His PLAXIS artworks use PLAY mixed with PRAXIS to generate the ideas and incorporate: childhood toys, puzzles and games. 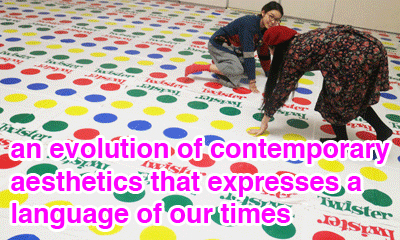 These explore abstraction and historical symbolism as well as expressing a relationship to childlike creativity. 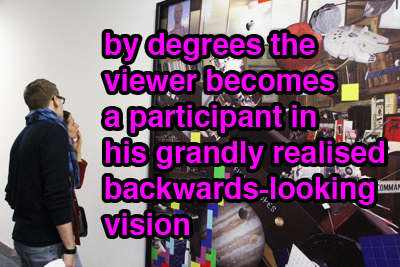 His INTERMADES use existing games and objects, which are brought to life through artscores. These involve an interaction or activity guided by the score itself and are usually made or acted out by someone other than the artist himself. His work has appeared in a variety of International Art Magazines, Catalogues, Newspapers, Radio & TV, including: Fefe & Digimag, Italy, Relevant, Spain, New York Times, USA, The Guardian, UK, The Times, UK, Wave Radio, Prague, Czech Republic and BBC 1, UK. In April 2016 Johnson-Perkins published an academic paper on his current work in the International Journal of Scientific Research and Innovative Technology. 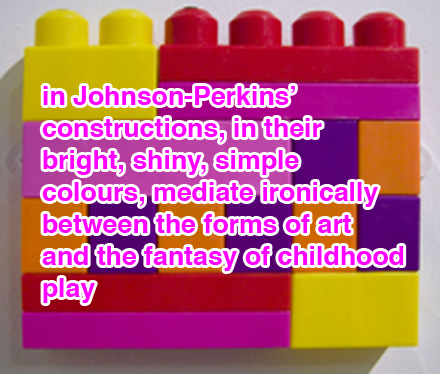 "...in Johnson-Perkins’ constructions, in their bright, shiny, simple colours, mediate ironically between the forms of art and the fantasy of childhood play..."
"...an evolution of contemporary aesthetics that expresses a language of our times..."
"...by degrees the viewer becomes a participant in his grandly realised backwards-looking vision..."
"...the way Johnson-Perkins reveals memory is special and unique..."